Whether the complaint is coming from a spouse, a roommate, or even yourself (! ), this recipe is an easy solution for that pesky little problem. I always break this dish out when I’m getting bored with the same old roast chicken with vegetables. It’s great because it’s unique with a spicy and sweet flavor combination, full of super-healthy ingredients, and ready in under 30 minutes. Here are the key ingredients (chicken breasts not pictured). Looks easy, right? It is! Begin by heating 1 tablespoon of extra virgin olive oil in a large saute pan over medium-high heat. 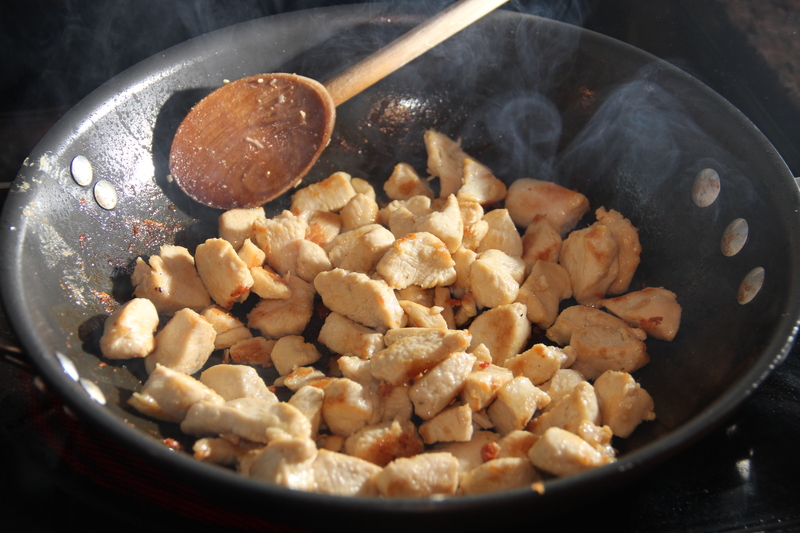 Cube some boneless, skinless chicken breasts and add the chicken, cooking until nicely browned on the outside. 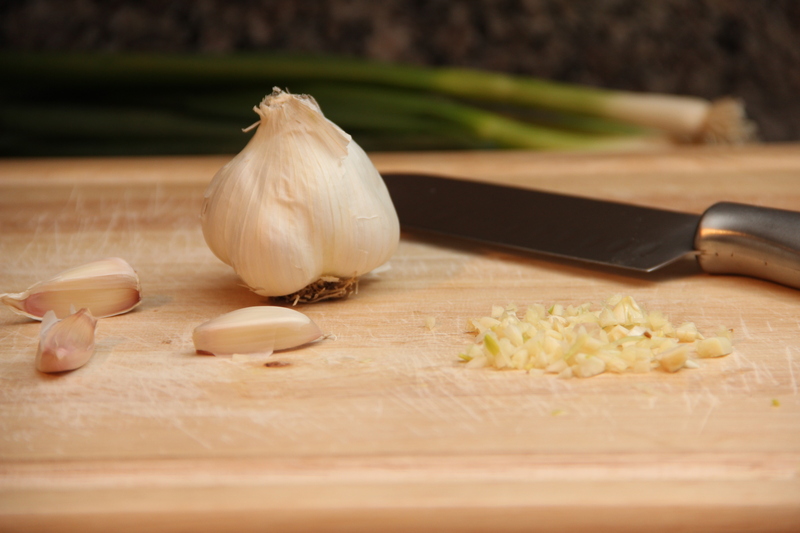 As far is garlic is concerned, – and you probably guessed this if you’ve read a few of my recipes – I’m kind of a fan. Okay, a really big fan. Here’s why: 1) it adds so much delicious flavor to such a wide variety of savory dishes 2) it’s a superfood with tons of antioxidants that protect against heart disease, high cholesterol, and cancer (one study found that women who regularly consume it had a 50 percent lower risk of developing colon cancer). 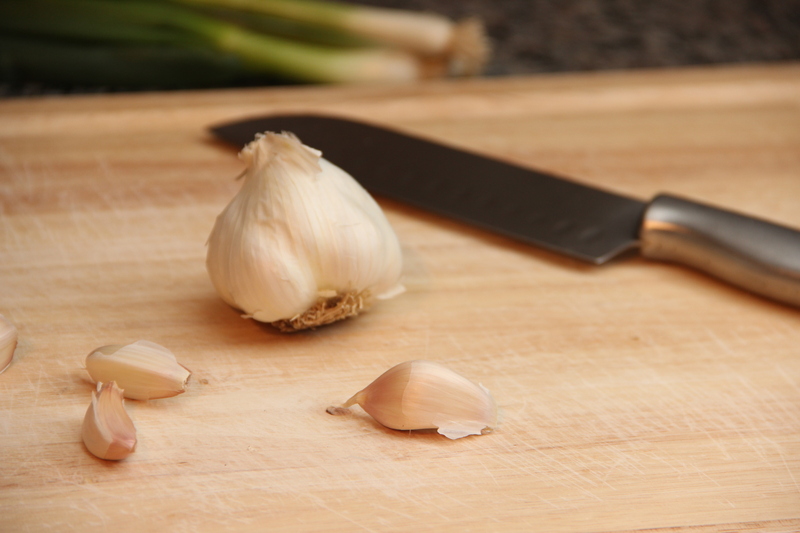 Reduce the heat to medium and add the minced garlic to the pan. 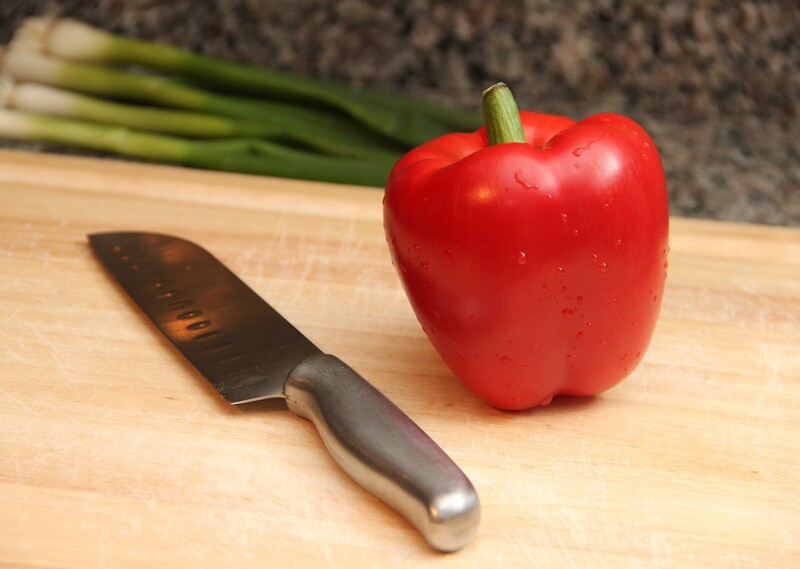 Chop up a bell pepper and add that to the pan as well. 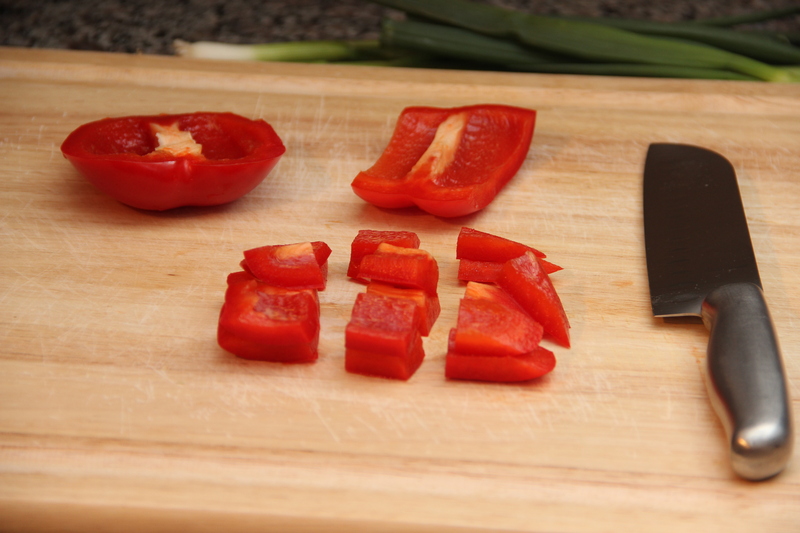 The fastest way I’ve found to chop up a bell pepper: set it upright on a cutting board. 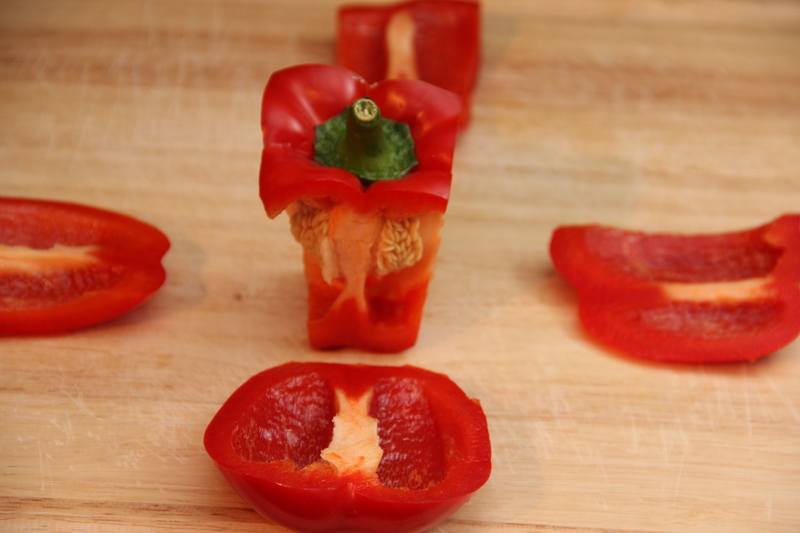 Now make four cuts from top to bottom, along each side of the pepper, leaving the center with the stem and seeds intact. Now you can easily throw away the part you won’t use. And easily chop up the four quarters. I pile two sections on top of each other to get the job done in half the time. Next, toss the frozen pineapple into the pan. Add the honey and soy sauce. Just be sure to use a low sodium soy sauce. Check out the nutrition label on a bottle of regular soy sauce (about 40 percent of your daily value of sodium in just 1 tablespoon of regular soy sauce) and you’ll understand why! Use the low sodium variety, and then you can control how much salt is added to your dish. Add the red pepper flakes. Use about 1 teaspoon for a spicier dish. Use only about 1/2 teaspoon if you prefer a milder dish. 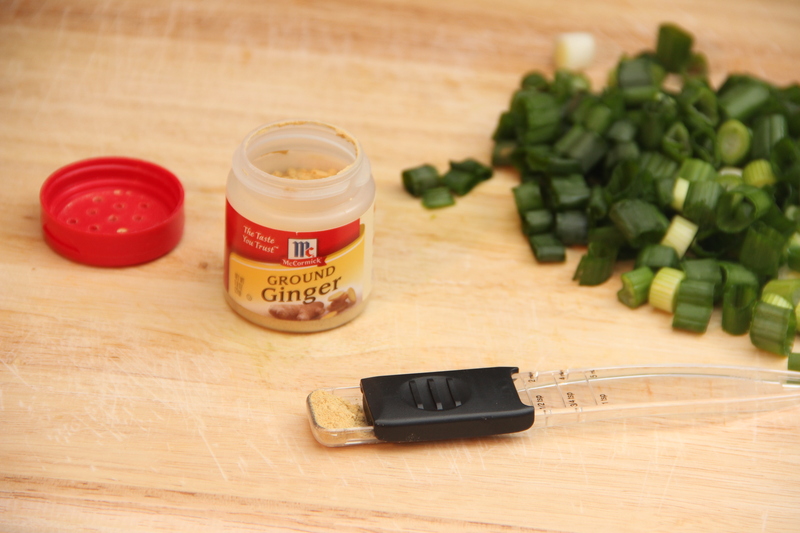 Ground ginger is a great item to add to your pantry if you haven’t already. If you’ve ever looked at fresh ginger in a grocery store and thought it seemed too intimidating – why not start with ground ginger, which delivers the same health benefits without the work required to prepare fresh ginger. Ginger is full of antioxidants. Studies have shown ginger may: ease colds and sore throats, help lower cholesterol and blood pressure, protect against cancer, and act as a strong anti-inflammatory (good for keeping your skin clear and healthy, among many other things). 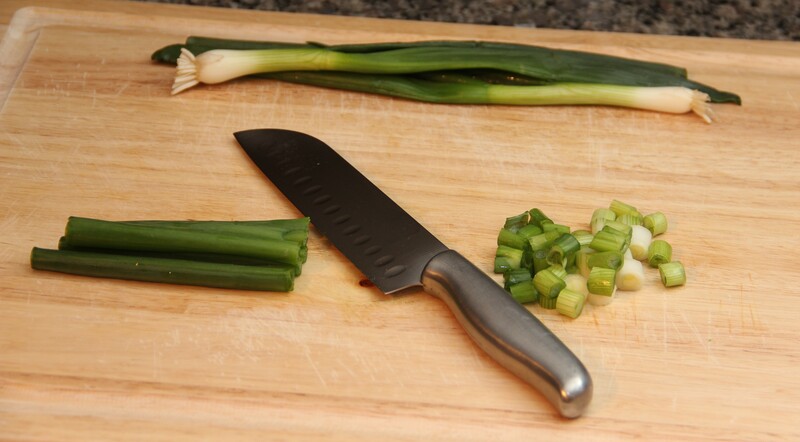 Next, grab the green onions and chop off the roots and the tips. Then slice them up and add to the pan, along with the shredded carrots. 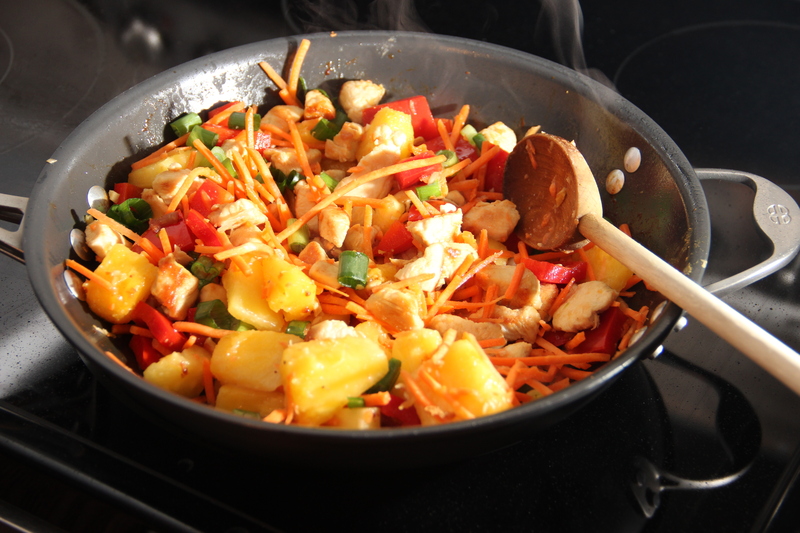 Stir and cook for a couple of minutes, allowing all the flavors to combine. Serve with steamed brown rice. Definitely not chicken-as-usual. 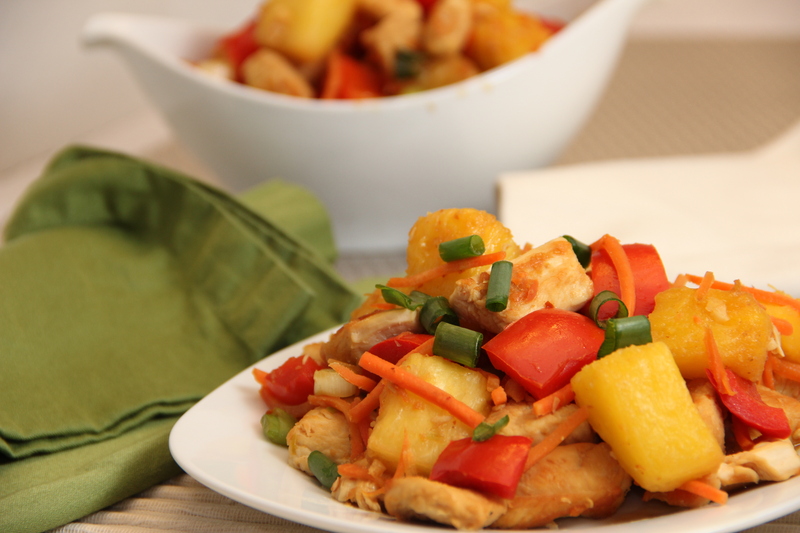 This dish – savory and sweet with a spicy kick – will wake those taste buds right up. Plus, it’s quick and easy for a weeknight meal. Heat the olive oil in a large saute pan over medium-high heat. Season the chicken with salt and pepper and saute the chicken until browned, about 7 minutes. Reduce the heat to medium. 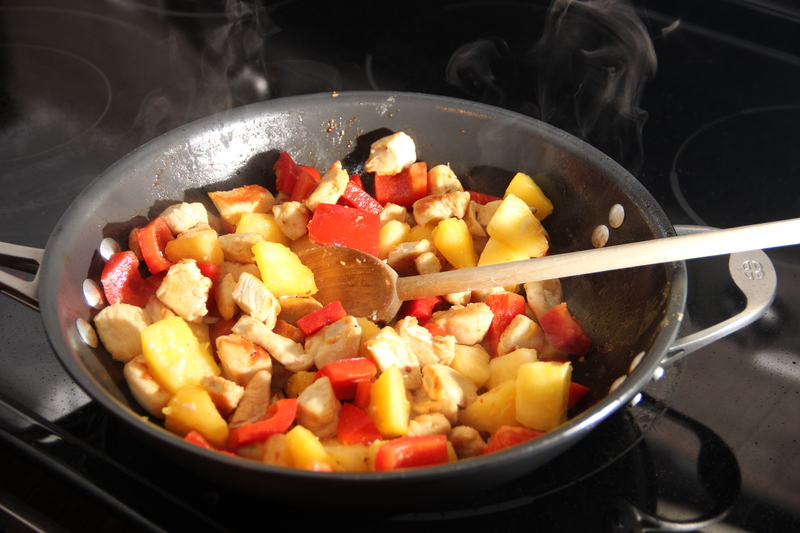 Add the garlic and bell pepper and cook until softened, about 5 minutes. Add the pineapple and season with salt and pepper. Add the soy sauce, honey, ginger, and red pepper flakes. Add the shredded carrots and green onions and cook for a few minutes more. Serve over steamed brown rice. Looks and sounds fabulous but sadly, I’m allergic to pineapple so I won’t be trying this one. That’s so sad! What if you tried it with frozen mango chunks… another flavor that might work. Love mango – great idea! Pineapple on sale @ local store for $1! My changes: fresh 1/2 pineapple, 1 Tab. Chinese garlic hot sauce (so only 1 minced garlic clove, minus 1 tsp. hot pepper flakes), 1 addtnl Tab. soy sauce, + 2 Tab. Mirin sake. Worked beautifully! We loved it. Just hot enuf w/o being too sweet. Thanks!! Love the spicy-sweet idea, plus all the gorgeous colors and good-for-you ingredients! The most organised food photos on the net. I’m going to try this out! Like the look of this …. and I can eat chicken 5 times per week. *smile – this is a “tryer” for me. Definitely putting it on my “make in March” list! I like sweet with a hit of spicy – or actually, prefer spicy with a little sweet – and it looks like this answers to that very well. Looks really good. Another recipe we will be trying. I must try this, looks delicious! I have, by the way, nominated you for the Versatile Blogger Award, though I know you’ve already been through this! I just recently discovered your site while searching for pup treats (Calvin is freakin’ adorable & my pup thanks you for the treat recipies!). I made this recipe for dinner tonight. Really easy and so tasty! Thank you for the great site and recipes! 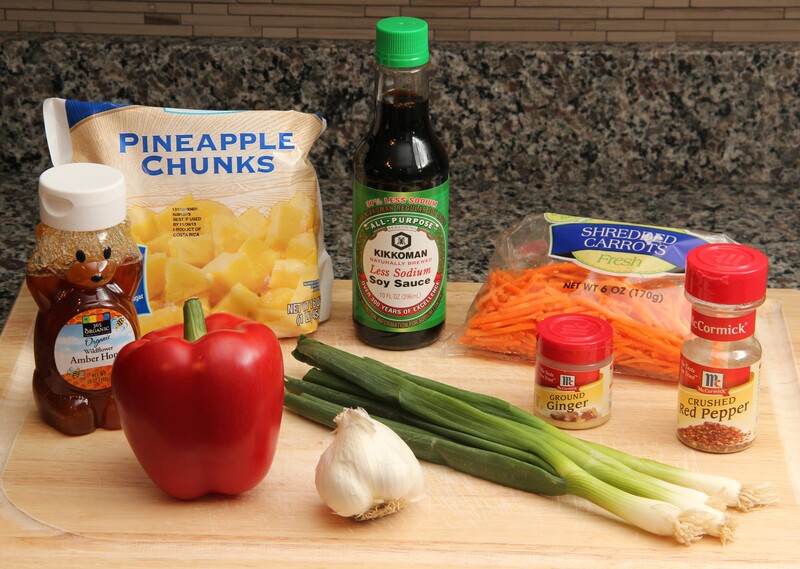 I found your recipe by searching for “chicken pineapple red pepper”. I made it tonight and it’s a big hit. I garnished it with grilled sesame seeds but otherwise used the ingredients as listed. Thanks! 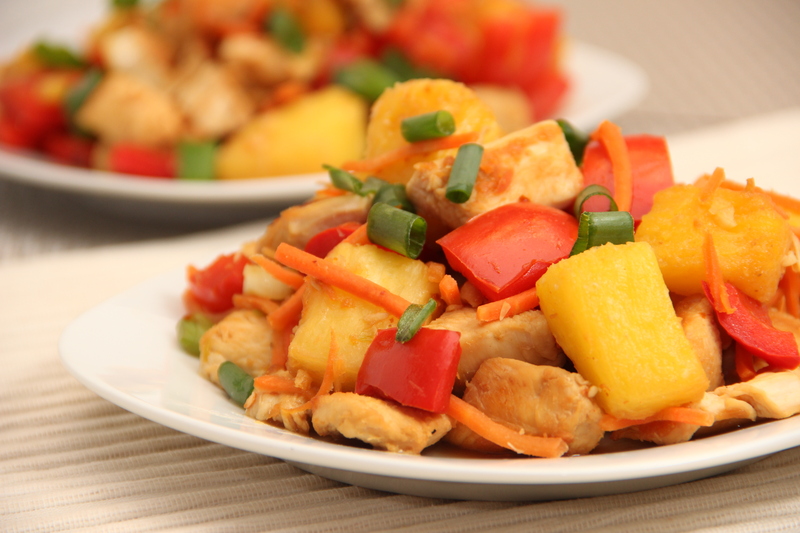 Pineapple and peppers are absolutely the BEST with chicken. I know what I’m making for dinner tonight! Construction Site Party | Happy Birthday Trevor!